Following an extensive article on our Twite collection in the Western Morning News, both the BBC and ITV came to film the collection and talk to Roger Radcliffe and Liz Thompson for items in their evening regional news programmes. The poignant story of Lt Llewellyn Twite and his fellow tunnellers (all Cornish miners) really caught the imagination, and Roger and Liz were able to explain what had happened to them and show some of the items which make up the collection, including Lt Twite’s kitbag, medals, pipe and binoculars. The most poignant items, his mud-encrusted watch and the letter from his children, posted after he had died on 1 December 1915 but before news had reached his family, aroused the most interest. Both the BBC and ITV broadcast the items in their evening news programmes on Thursday 24 April. We hope some of you watched one or the other! Bringing to an end a very busy few weeks at the Museum, our annual Members’ Preview, kindly sponsored by Mandy Kimmins and Printout Printing Services, was a very lively and enjoyable morning, despite Mandy having to leave early to organise a Fun Dog Show! She left the organisation in the capable hands of Ali Basher and Jain Orde. Some 40 Members enjoyed refreshments, a chance to look at our new displays and Book of Remembrance, and to have a good chat. Mike Furness was kept busy selling new items from the shop, and Roger Radcliffe summed up everyone’s feelings when he thanked Mandy, Ali and Jain for giving Members such a happy morning. 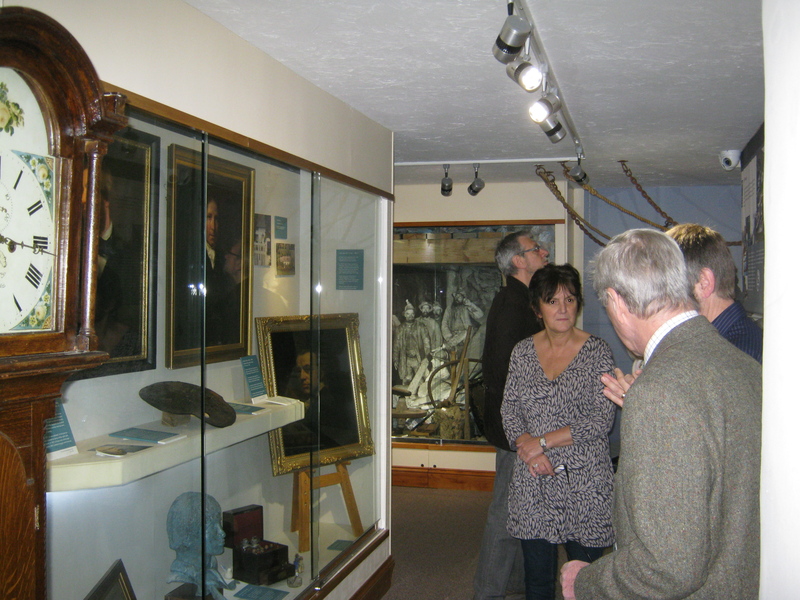 From 25 – 31 March 2014, St Agnes Museum joined museums large and small (mainly large!) from different countries in the first-ever #MuseumWeek on Twitter. Each day under our Twitter name @stagnesturtle we tweeted on a different theme. 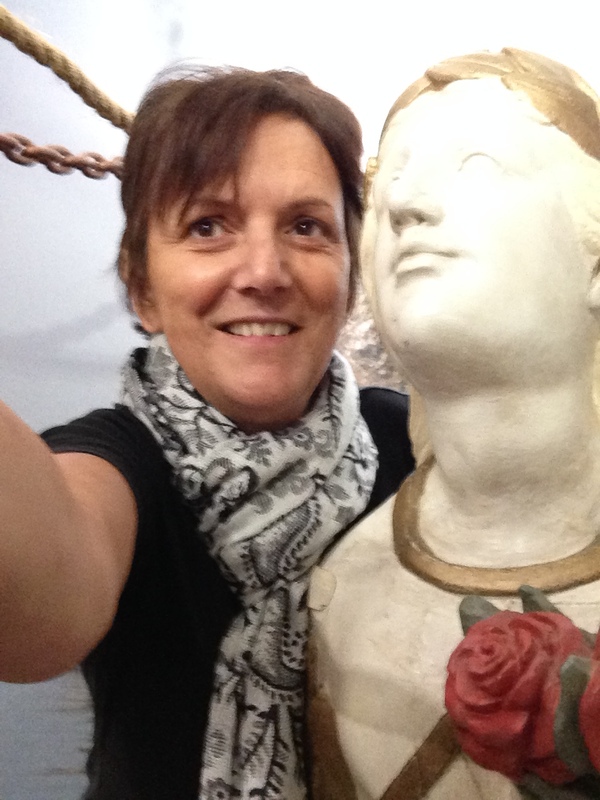 These included #AskACurator, #MuseumMastermind and #MuseumSelfies, where our curator posed for a self-portrait alongside The Lady Agnes figurehead! It was a great experience for our Turtle to share Twitter space with the V&A, the British Museum and the Ashmolean and good national exposure for a small local museum. Our followers doubled in number to almost 400 during the week, with lots of re-tweets and favourites along the way. We really are part of the digital age here at St Agnes Museum, so do follow us @stagnesturtle for news from the museum and the parish of St Agnes. 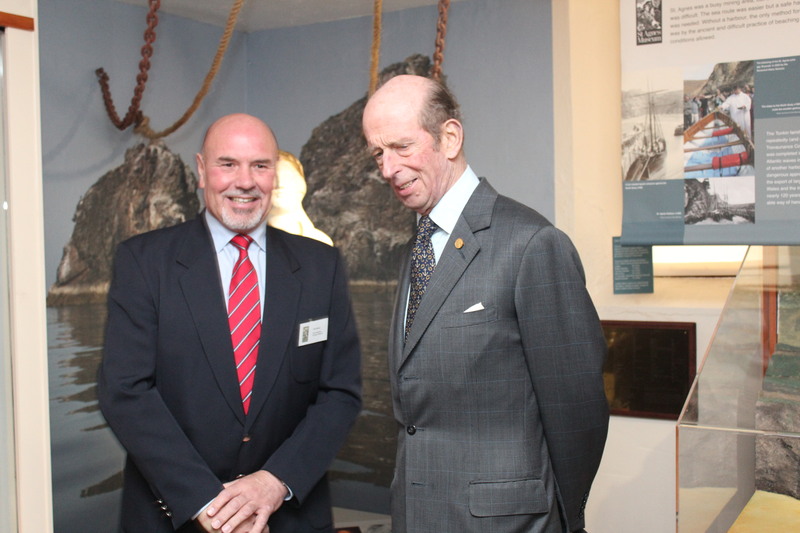 On 1st April fifty volunteers and supporters gathered at St Agnes Museum, decorated with its own “Queen’s Award” bunting, to welcome HRH The Duke of Kent who had asked to visit the Museum and to meet as many volunteers as possible. Before the visit volunteers had given the Museum a spring clean and prepared the new exhibitions for 2014 and everything looked wonderful. 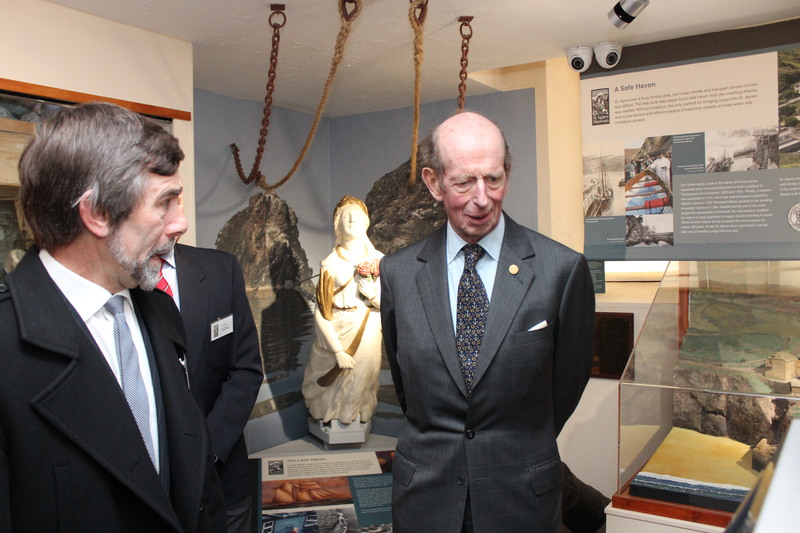 Despite being delayed by fog, the Duke, who was welcomed by Museum Chairman Roger Radcliffe, took time to meet volunteers and discuss the running of the museum, including our use of social media, as well as examining the exhibits. 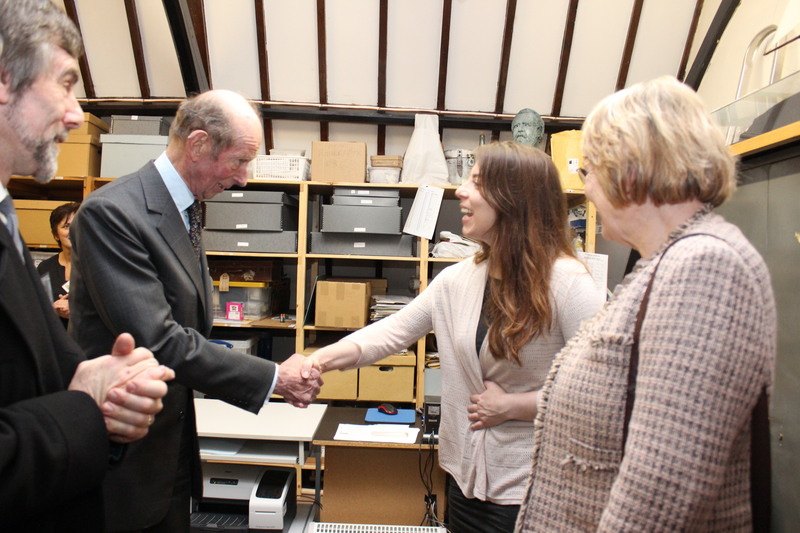 He was especially interested in the new exhibition commemorating the 1914-18 War and in the booklet containing detailed research on the dead honoured on the Parish war memorials at St Agnes, Mount Hawke, Mithian and Blackwater. Having just visited Trevaunance Cove, the Duke was intrigued by in the model of St Agnes Harbour in its 19th century heyday and the figurehead of the Lady Agnes, a schooner built on the beach at Trevaunance. On the touchscreen we were able to show the Duke photos of his 1977 visit to St Agnes Lifeboat Station when he presented Roger Radcliffe with a letter on vellum for his part, as a lifeboat crew member, in a dangerous rescue. 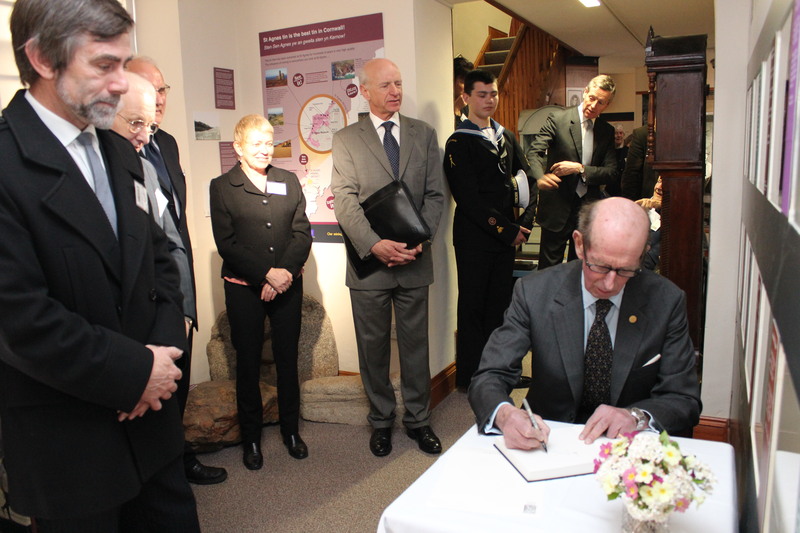 Before leaving, the Duke signed the Visitors’ Book and was presented with a basket of local produce – including a family of chocolate leatherback turtles in homage to the Museum’s leatherback turtle – by four pupils, Sarah, Lily, Nat and Aaron, from St Agnes Primary School.